Three weeks ago my little man started Kindergarten. Now, he has been attending school prior to this but for some reason this feels like he has officially entered “school.” And likewise, I feel like with the start of the school year comes a regular “school” year schedule. The one thing that can be tricky is the weeknight dinner. I leave work at 5, pick up both kids (joyfully from two different locations – can’t wait until they are both at the same school!) and get home around 6pm with two hungry kids. This does not leave much time to ponder the night’s meal let alone whip something up. My solution to this is to cook the main course over the weekend. My husband’s makes one dish and I make another. We make enough of each so it will last two meals. So the only thing I generally need to mess with is a some sort of veggie side. I was looking to expand my Indian vegetable repertoire when my mom visited last month and she did not disappoint me. Even though we were out of town much of the week she and my father were here, we still managed to squeeze in her showing me this recipe. It comes together in under twenty minutes and requires only a handful of ingredients. It has a pretty distinctive taste thanks to ajwain or carom seed. Ajwain is actually a flower pod and smells very similar to thyme but tastes more like fennel with an edge. In a pinch, you could substitute fennel. It won’t be exactly the same but it will still taste lovely, although with a bit more mellow flavor. The dish gets a tang from chaat masala, a blend of spices that include mostly sour ingredients like rock salt and dried mango powder. Both chaat masala and ajwain can be found at your local Indian market. I use only red peppers because I prefer their flavor over the green which I find bitter. Using a mix of colors would also be beautiful here. And this dish would pair nicely with non-Indian food as well. In fact, it could elevate a roast chicken dinner into something a bit more exotic if you go after that sort of thing. Me, I’m just happy to have this in my arsenal when I’m faced with two hungry and grumpy kids! Recipe for a quick side dish featuring bell peppers and the distinctive taste of ajwain. Heat the oil over medium heat in a skillet. Add the turmeric, ajwain, ground coriander, and pepper flakes. Let them sizzle for a minute or so until they release their aromas. 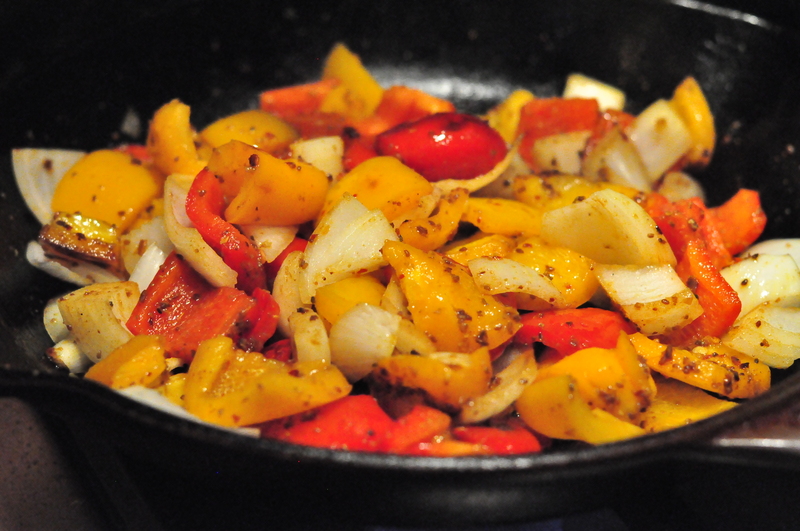 Add bell pepper pieces and toss to cover in the spices. Add the salt. Add onion and stir. Cover and cook until the onion has softened - 3-5 minutes. Taste and adjust seasoning to your liking.